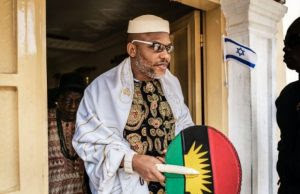 Family of leader of the proscribed Indigenous People of Biafra (IPOB), Nnamdi Kanu, has alleged intimidation and harassment by security operatives. the security agents to order. In a statement, the family’s spokesman, Prince Emmanuel Kanu, said operatives of the Department of State Security (DSS) have, in recent times, been patrolling the Afara Ukwu country home of the Kanus and, in particular, mounting a 24-hour surveillance on their home. In addition, Kanu said police in Abia State have begun the construction of a security post close to the family house, all in a bid to continue their intimidation and harassment of members of the family, under the guise of providing security in the area. He said what security outfits are doing in Afara Ukwu is uncalled for, since the area is one of the most peaceful in Igbo land. He advised them to rather direct their energies and professional prowess, if they had any, to the NorthEast, where Boko Haram had decimated the population, and Benue State, where he said Fulani herdsmen have turned into a slaughter ground. Kanu said it is getting clearer by the day that security operatives are planning to raid their home again, but said it would serve the image of the security outfits better if they return what they looted from their house during the first and second raids, including their mother’s two boxes of clothes. » DR. CHRIS OKAFOR HAILS NNAMDI KANU’S BAIL, INSISTS GOVERNMENT MUST DO MORE.